Have you ever seen cupcakes so pretty? 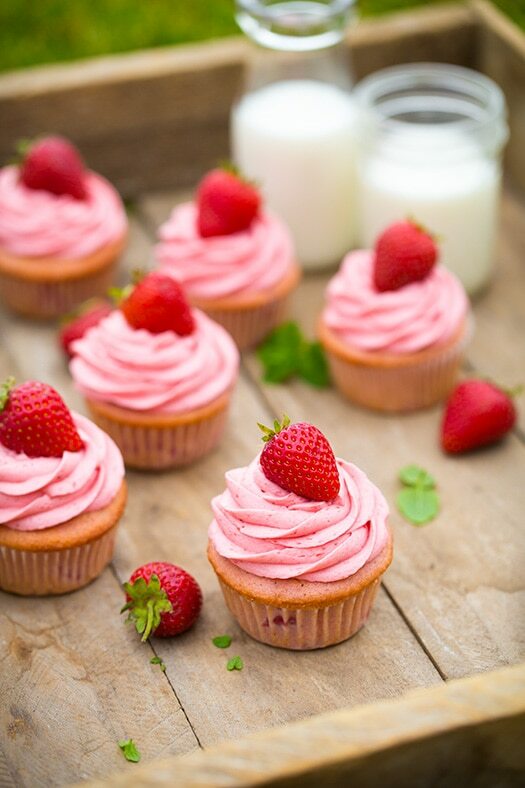 These Strawberry Cupcakes are made with chunks of fresh strawberries in the cake batter and are topped with a luscious pink Strawberry Buttercream Frosting. These cupcakes are just bursting with flavor and would go down a treat at any celebration! I know, I post a ridiculous amount of cupcake recipes. But really, can you blame me? If I were to do a cookbook someday, it might just be a cupcake cookbook because I’m just that obsessed with them. 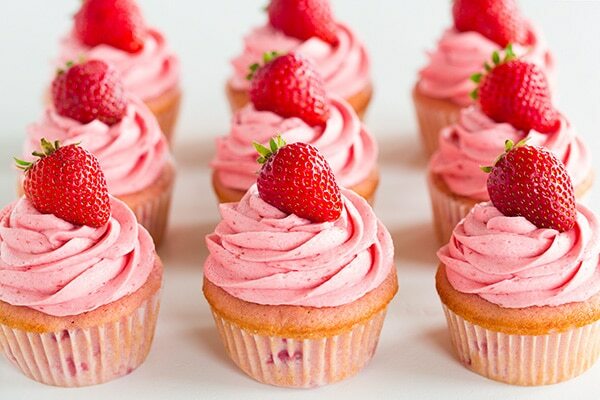 And I can’t even begin to tell you how obsessed I am with these strawberry cupcakes. A-MAZ-ING! They are hands down the best strawberry cupcakes I’ve ever had, and they’ll likely be your new favorite too. Yes, that could sound totally braggish (since it’s my own recipe), but I’m kinda thinking these deserve bragging rights :). Last week I made a layered strawberry cake. Very similar to these, but I topped that with a cream cheese frosting. Well, when you combined cream cheese frosting with sliced strawberries between cake layers things can get a little slippery. Loved the cake, just not the way it held up, so I made these strawberry cupcakes with strawberry buttercream frosting to share instead. And I actually preferred going all strawberry instead of a cream cheese frosting, because it didn’t diminish that sweet strawberry flavor at all. It just added to it, of course. 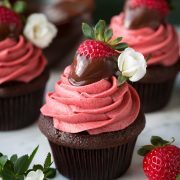 In the past, I’ve tried many strawberry cupcake recipes and they’ve all left me wondering, where is the strawberry flavor? I’d see a hint here and there but these, oh these! They are overflowing with strawberry flavor. The liquids of this batter are made up of a strawberry puree and milk blend, then chopped fresh strawberries are folded into the batter. 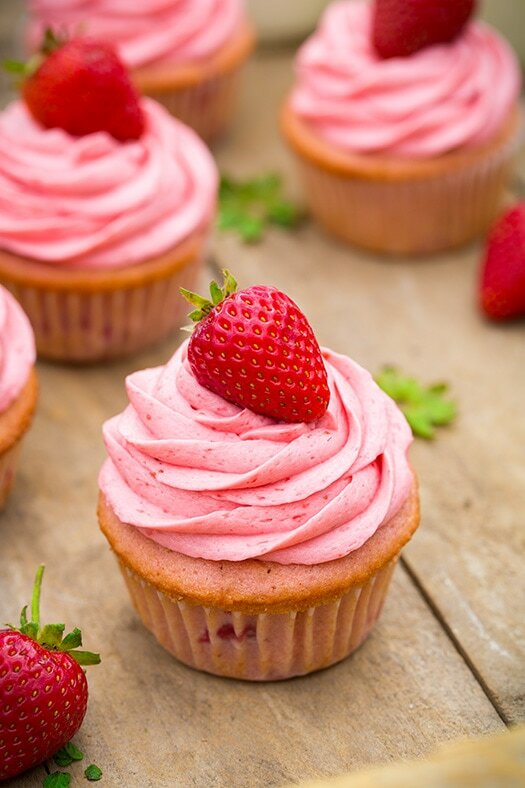 Then after they are baked they are topped with more fresh strawberries (which is a lovely hidden surprise underneath the frosting), and then more strawberry puree is creamed into the fluffy, melt-in-your-mouth homemade buttercream frosting. And the key to the frosting is that it is made with a strawberry reduction (meaning we are going to simmer off 2/3 of the waters in the berries so we can concentrate that irresistible strawberry flavor). 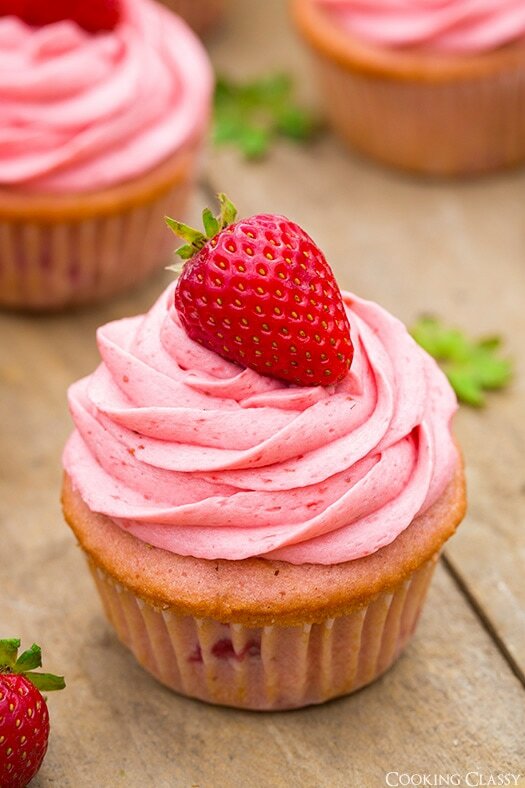 Yes, it would be nice if we could just add 2/3 cup of fresh strawberry puree into a frosting but we all know that’s not going to happen without a royal disaster, soup of a frosting. This is definitely my new favorite strawberry buttercream frosting and I know I will make it time and time…and time again. If you are lucky enough to have any frosting left, spread it on graham crackers for a delicious treat. The cake batter has plenty of chunks of fresh strawberries in it so you get the best strawberry flavor in every bite! To make the batter a cute pink color, I added a few drops of food coloring, but you can leave that out if you prefer, it won’t affect the taste. Sift cake flour into a bowl, then add the baking powder, baking soda and salt. Whip butter and sugar until pale and fluffy. Then mix in the egg and egg whites. 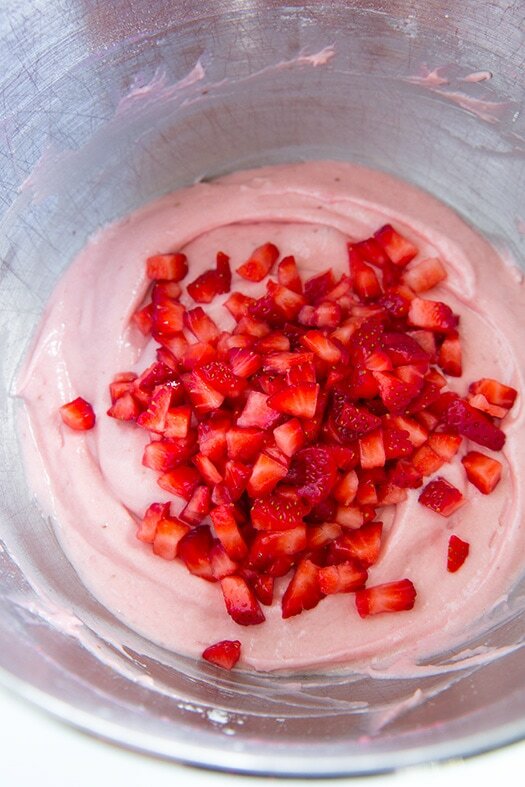 Whisk together the buttermilk, part of the strawberry puree and vanilla extract. Add the flour mixture and buttermilk mixture to the butter mixture. Fold the diced strawberries into the batter. Divide it amongst the lined muffin cups. 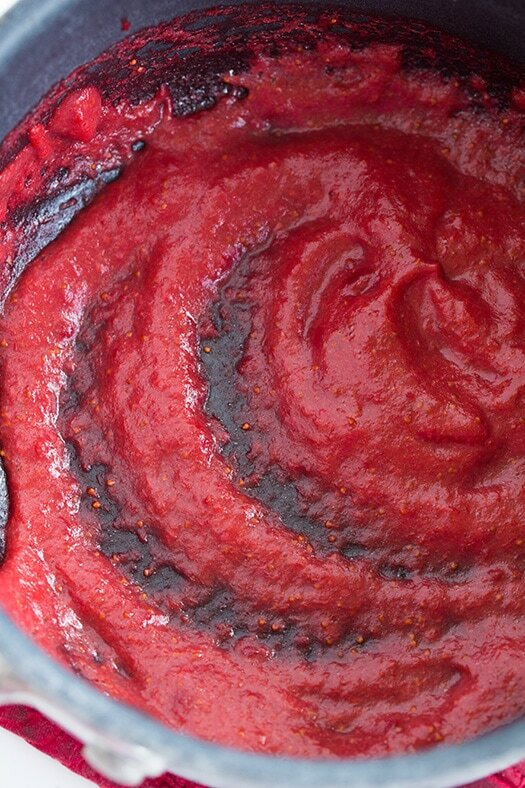 Add strawberry puree to a small saucepan. Heat mixture over medium-low heat, and simmer, stirring occasionally until reduced. Pour reduced puree into a small bowl, then freeze until cool. Whip unsalted and salted butter until very pale and fluffy. Mix in part of the powdered sugar, then blend in reduced strawberry puree, vanilla extract, and optional red food coloring. Add remaining powdered sugar and continue to mix until frosting is pale and fluffy. To assemble the cupcakes: Place some diced strawberries in the center of the cooled cupcakes then pipe the frosting around it. 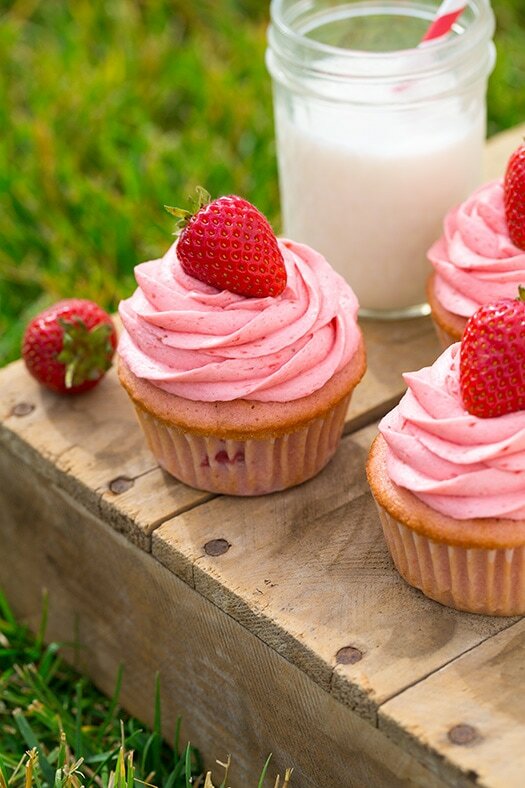 These cupcakes are packed with strawberries and taste incredible. Try not to skip this step because it’s so worth it! 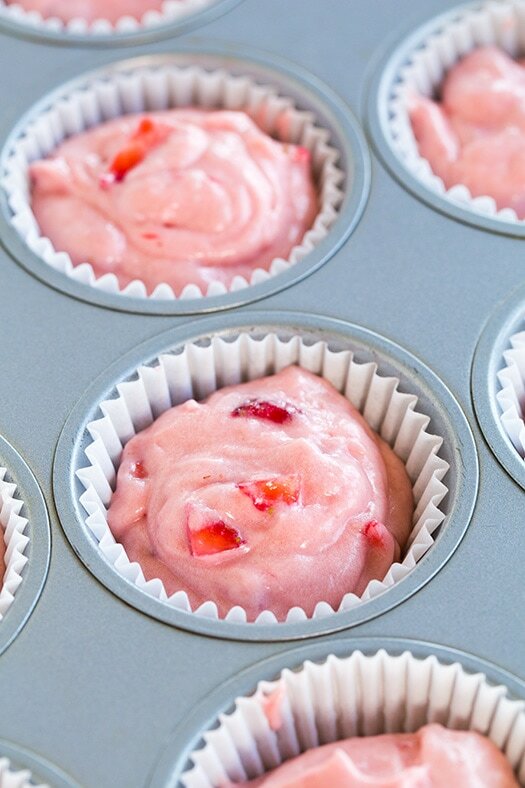 Store the strawberry filled cupcakes in sealed containers once cooled. Try not to squish the frosting when you put the lid on! You can freeze the unfrosted cupcakes for months, cakes freeze really well! 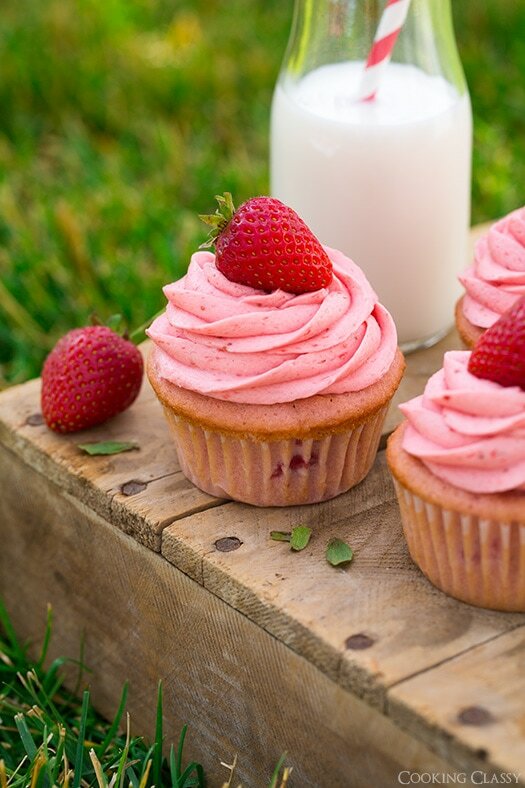 When you’re ready to enjoy the frozen strawberry cupcakes, sit them out on your counter to thaw completely before frosting. Let the cupcakes cool completely before topping them with frosting. 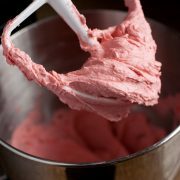 Add a few drops of pink food coloring to the batter and frosting for a deeper red color. If you don’t have buttermilk on hand, you can use a buttermilk substitute. I give instructions for my buttermilk substitute in the recipe card below. In the bowl of an electric stand mixer fitted with the paddle attachment, whip butter and granluated sugar until pale and fluffy (occasionally stop and scrape down bowl throughout entire mixing process if not using a paddle attachment that constantly scrapes bowl). Mix in egg then mix in egg whites one at a time. In liquid measuring cup used to measure buttermilk, whisk together the buttermilk, 1/3 cup strawberry puree and the vanilla extract. Working in three separate batches, beginning and ending with flour mixture, add 1/3 of the flour mixture (to the butter mixture) alternating with half of the buttermilk mixture and mixing just until combined after each addition. Fold in the 3/4 cup diced strawberries. Divide batter among 12 paper lined muffin cups, filling each 3/4 full (nearly 1/3 cup in each). Bake in preheated oven 20 - 23 minutes until toothpick inserted into center of cupcake comes out clean. Allow to cool in muffin tin several minutes then transfer to a wire rack to cool completely before frosting. 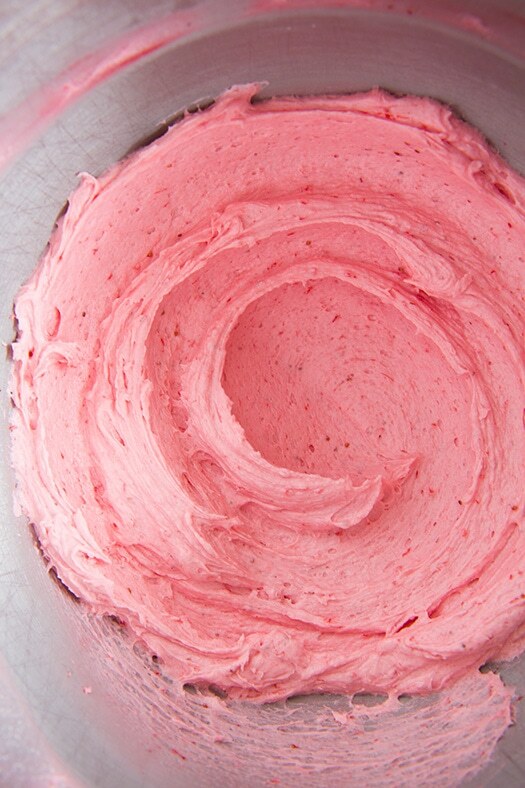 For the Strawberry Buttercream Frosting: Add 1/2 cup + 2 Tbsp strawberry puree to a small saucepan. Heat mixture over medium-low heat, and simmer, stirring occasionally until reduced by about 2/3 to 3 Tbsp, about 10 - 14 minutes (measure and if it isn't quite 3 Tbsp then return and continue to simmer, if it's not reduced to correct amount it will make frosting runny). Pour reduced puree into a small bowl, then freeze until cool (stir occasionally for even chilling, it will chill quickly in the freezer since it's such a small amount). In the bowl of an electric stand mixer fitted with the paddle attachment, whip unsalted and salted butter until very pale and fluffy (nearly white. Stop and scrape down bowl occasionally throughout entire mixing process if not using the paddle attachment that constantly scrapes bowl). Mix in 1 cup powdered sugar, then blend in 3 Tbsp reduced strawberry puree, vanilla extract, and optional red food coloring. Add remaining 1 1/2 cups powdered sugar and continue to mix until frosting is pale and fluffy, adding in an additional 1/4 cup powdered sugar if needed to reach desired consistency. 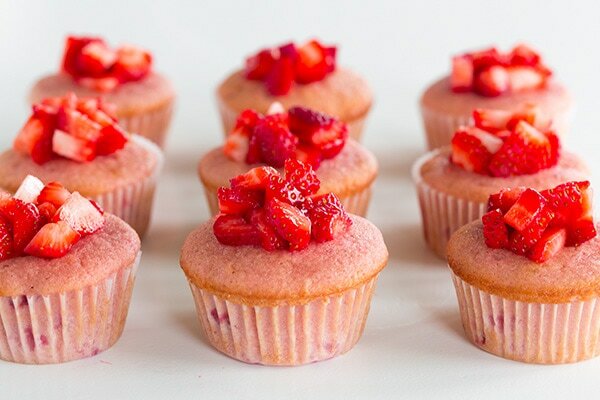 To assemble cupcakes: Place a small mound of small diced strawberries on top center of cupcakes. Pipe frosting around and over berries then decorate with a whole small strawberry. Store cupcakes in an airtight container. You can freeze the unfrosted cupcakes for months, cakes freeze really well! 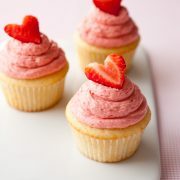 Trisha R Aranda: Made these for Valentine’s Day. Used regular flour, I sub the buttermilk for heavy whipping cream, added 2 large spoons on Greek yogurt, doubled the strawberry puree which I made from frozen strawberries that cooked down in a 1/4 of a cup of sugar.